I made these cookies for my husband's friend who is really enthusiastic about surfing. He loves to surf every chance he gets. I was happy to hear that he loved the cookies, and wish him well! Very springy! Super cute idea! Love the surfing eggs. The bright color are enough to cheer me up. I know they tasted wonderful! How sweet and thoughtful of you to bake these beautiful cookies for him! These are so cool! I love the surfing/Easter combo. Its such a sweet and thoughtful send-off for your friend! I'm sure he'll love them! Hi! I just scrolled through all your posts I've been missing. You have been busy doing some adorable Easter baking! I love the all the cookies and the cake, it's quite lovely. I hope you enjoyed your time helping your daughter. Can't wait to get blogging again, I feel incredibly guilty that I haven't been able to get to it lately! These colourful surfing eggs are so cool! I'm sure that your friend will be touched. Happy Easter to you and your family! What a sweet parting gift. They do look like elongated Easter eggs. So pretty and fun. What a great gift...perfect Easter treats too! Again, your cookies are so amazing! I love all the colors! You are so thoughtful to make these for your husband's friend! These are so cute. I love the bright colors that just say Spring! These are so bright and fun! 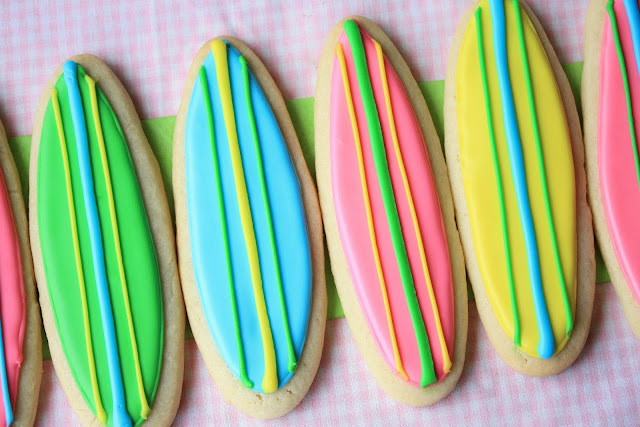 !What a fun idea to make surfboard cookies. I hope your friend stays safe! Love the title of this post! So sweet of you to send your friend off with such a lovely homemade and heartfelt gift. God's speed for his safe return. Those cookies are adorable, and it's so kind of you to bake them for your friend. I love the Easter spin you gave them! So cute and festive. Great job, Sue! Happy Easter! California style indeed! Although I couldn't say, living in Davis haha. Look great though! I've never surfed in my whole life (no sea here), but I'd love to try it out :) The cookies look once again perfect! Very cute to make the surfboards for easter! I made some surfboard cookies similar to these for a beach themed baby shower last year and it was so fun! I love all the amazing stuff you do with food! I'm a new follower! 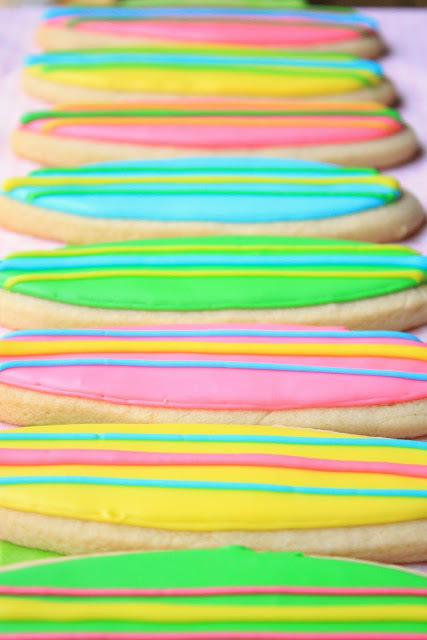 I would love it if you stopped by my blog and checked out my surfboard cookies!